Mike had been mailing us all week raving about the Little River, which rushes down out of the Cascades at a respectable 120 fpm gradient. There were also a bunch of steep side creeks we were interested in, but the Little ended up occupying most of our day. We put on at the road 165 bridge and bounced down a few shallow gravel bars and then immediately had to portage a log. "More water, less wood!" somebody grumbled. 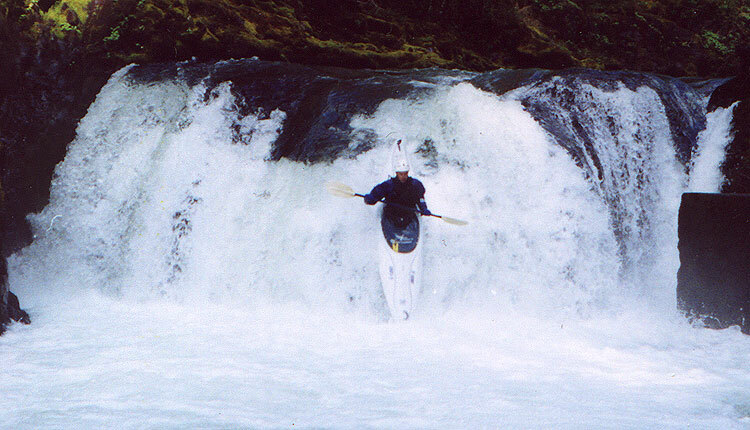 I had seen a mean looking class V about a half mile down during the shuttle so we ran the rapids above it carefully, with Gabe Flock probing. 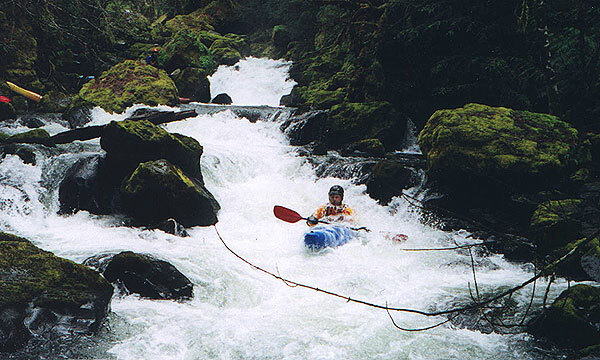 Finally the river plunged out of sight into a jumble of boulders and I signalled Gabe that we had arrived. We got out and scouted, and none of us liked what we saw- a very difficult lead in to a nasty looking waterfall. Gabe was the only one of us seriously thought about running it, but in the end he regretfully shouldered his boat and sweated through the long portage like the rest of us. I think at higher water this drop would become much easier. 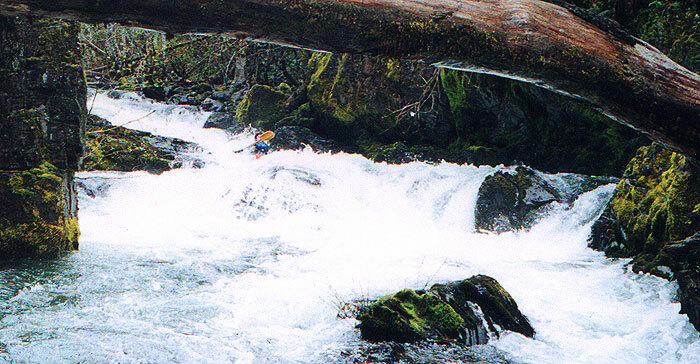 Steve Stuckmeyer with the exit falls on the first big drop in the background. Gabe twists to avoid the rock at the first ledge. Below this drop the river narrowed dramatically and entered a deep gorge. 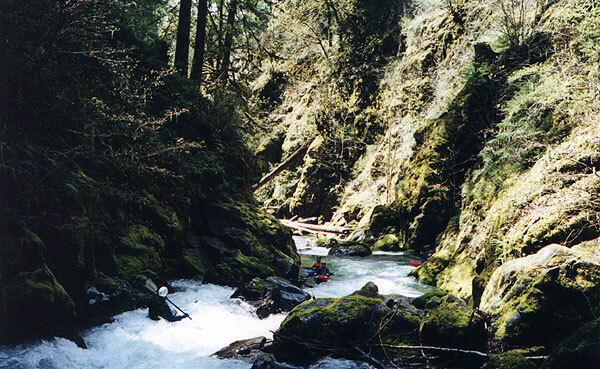 As we worked our way down the rapids steepened and (unfortunately) the logs increased. I was just starting to wonder what would happen if we ran into an unrunnable, unportagable drop when all hell broke loose. Gabe and Steve were probing far out in front when Steve dropped into a narrow chute in the middle of a log jam and was vertically pinned. He was ok, but a little more water on that side and it would have been very serious. His boat was pretty well stuck after he climbed out of it, but we were in no position to help. 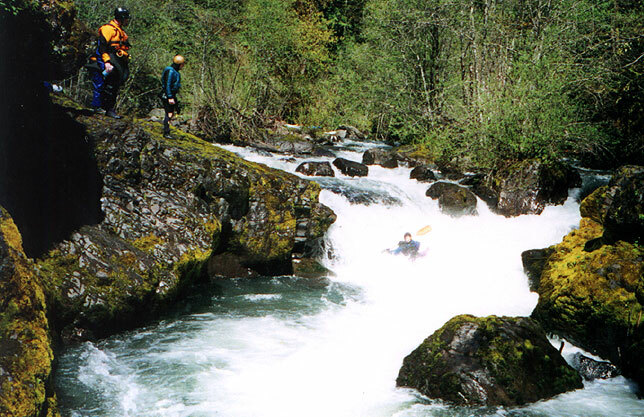 When Steve got into trouble we were upstream prying a boat off of a midstream boulder at the top of the logjam. 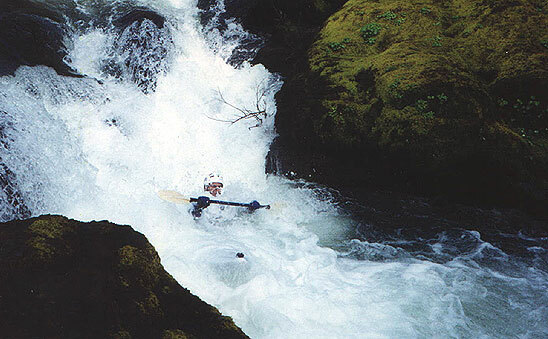 Mike had flipped in a drop above the logs and bailed, fearing that he would be swept downstream into the jam. Meanwhile, I sat in the eddy at the top of the gorge while Mike, John, and Pete freed the boat so I could run the first drop above the logs. We regrouped and rounded the corner only to find an even bigger log jam with two tiny figures down in the middle of it pulling on something with a rope. By the time we worked our way down through the maze of logs Gabe and Steve had freed Steves boat and we began a long portage around the final logjam. The next major drop was in my opinion the best on the river and was very similar to the first ledge, only more difficult. This time there was a boulder sieve on the river left side just waiting to catch the unwary paddler, so this one too required a strong midair turn to land in the channel pointing right and avoid getting pushed into the sieve. I was thoroughly enjoying myself after this one! Gabe runs the second ledge. The boulder sieve is visible in the bottom right hand side of the picture. Just downstream was the confluence of Black Creek and another nasty falls that we seal launched around. Just downstream of this falls is another nice ledge drop pictured here. Once again, I think Black Creek Falls would be significantly easier with more water. Mike looks on while John seal launches, Pete ponders the next drop, and Steve and Gabe wait in the pool below. 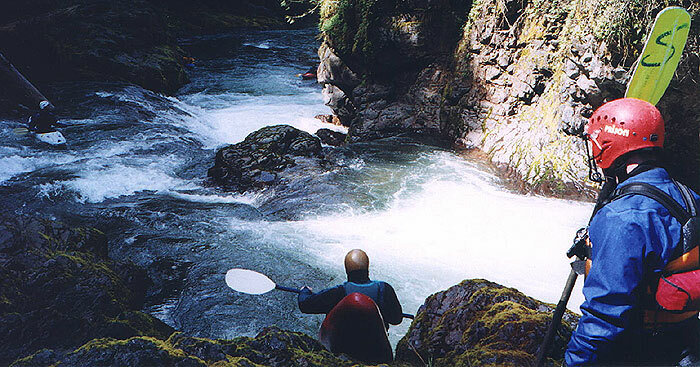 Character: Roadside run with ledges, falls, and one gorge containing a large logjam. Access: Heading east from Roseburg on SH 138, turn right onto Little River Road, just before the town of Glide. Go upstream about 16 miles on Little River Road which becomes FS 27. Turn right onto FS 2792, cross the Little River, and stop at the White Creek Campground (the takeout). Return to FS 27 and continue 7.1 miles upstream to FS 165. Turn right, cross the (very) Little River and park in the turnout. For those desiring to put-in lower on the run, there are several places where access is readily available for the next 1.5 miles below FS 165. Gauge: None. 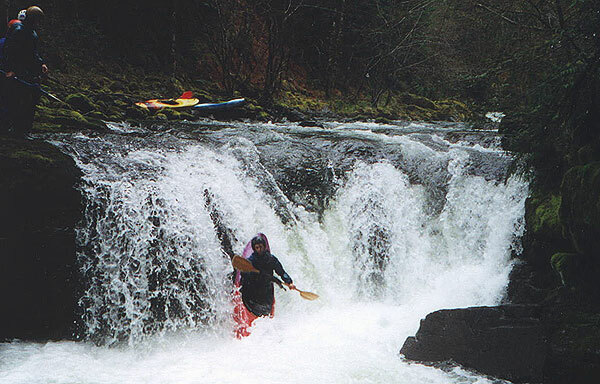 We ran it when N Umpqua at Glide was 3700 cfs and 5400 cfs at Winchester, which was very low for the upper 3 miles. Better would be 5000 and 7500, respectively.